Whats going on tomorrow at Lancashire County Council? There should be fireworks, but in the current climate it's likely to be more of of a damp fizzle. Last April county council cabinet members agreed to commission a consultancy called Price Waterhouse Cooper (PwC) to look at how LCC could streamline (i.e. cut) services to save money. The budget allocated from central government to local governments such as LCC has been severely reduced over the years resulting in LCC having to make cut-backs such as closing libraries and bus-routes etc. To make up the shortfall, LCC are even considering raising council tax. Allegedly, LCC paid between £3m and £6m for PwC to do the survey and report. The report shows it's so bad we're now having to beg the Tories (the council call it lobbying) for assistance with a £95m shortfall in resources for Adult Social Care forecast for 2020/21. The government should be adequately funding LCC to enable them to manage, subsidise, and run local services such as care homes and district nursing, so increasing the council tax only means the public are paying twice for the same services. *Council tax is based on the value of a property. The NHS isn't means-tested, but social care is. So integrating NHS services with social care services opens up the market to means-testing NHS services. Hence, patients will then have to pay for services which were previously free at the point of need. Social care is involved so the report also recommends LCC agree to go along with the STP plans for their area. They call it 'Health and wellbeing integration', I call it privatisation. 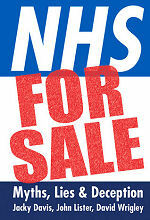 Its a very contentious report since NHS partners have not been involved in it. 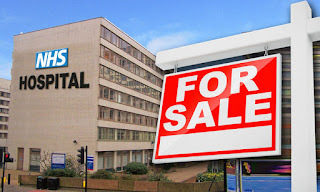 There's anger that LCC are to publish a detailed report, commissioned by the Council, which implies major NHS reorganisation without the report having any input from NHS partners (sound familiar?). link below.. Agenda Item 11. LCCs Health Scrutiny reporting back to full committee. 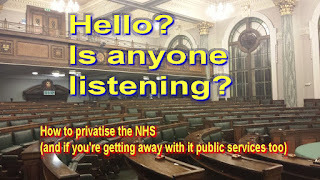 It's obvious even to a blind pig that the overall objectives of both agenda items is for central government to underfund public services to enable them to pursue their own privatisation agenda. And with the Tories in their second term of office, they are now pushing the boat out. Appendix to Item 4 (PDF) - PwC's Lancashire Public Service Delivery Model - An STP for public services? Research from the King's Fund indicates STPs have a high risk of Failure. Despite the introduction of the Sustainability and Transformation Fund, the financial reset and the use of a new financial `special measures’ regime, financial performance in providers continues to slide. As a result, reducing the net provider deficit to £250 million from the forecast £644 million at quarter one looks increasingly unlikely and indeed, there are greater risks it will rise rather than fall. This is despite a quarter of all trusts now reporting delays or cancellations of capital spending in order to support their finances. The latest Quarterly Monitoring Report from the King's Fund think-tank shows that increasing numbers of health trusts in England are also looking to reduce their clinical workforce, with 29 per cent now planning to reduce their headcount. While relatively few acute hospitals plan to reduce the number of staff, more than half of mental health and community health service providers are now planning to cut staff numbers. This threatens the aspirations to raise the quality of care set out in the Five year forward view for mental health as well as long-term goals to improve services in community settings. Alongside cuts to capital spending by trusts, more than half of CCGs are delaying or cancelling spending plans. This underlines the risks that the drive to cut deficits is having on the long-term transformation agenda for the NHS. Looking forward to 2020/21, the STP process has not led to any greater optimism about the prospects for achieving the £22 billion in efficiency savings needed to deliver the STP/Forward View. While some 79 per cent of trust finance directors think there is a high or very high risk of failure, now 90 per cent of CCG finance directors say the same, sharply more pessimistic than in July before STP plans were submitted or the planning guidance issued. With many organisations still expecting to end this year in deficit, no additional transformation funding available, and minimal real-terms growth in 2017/18 and 2018/19, NHS finance directors have found little to be optimistic about. 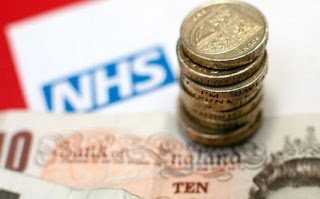 Last September , the Office for Budget Responsibility [OBR] stated the NHS is easily affordable up to and beyond 2030. 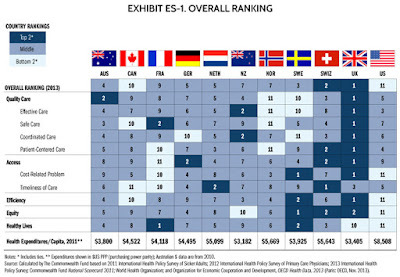 ■ MYTH: We need to change since we can't afford the NHS in its present form. 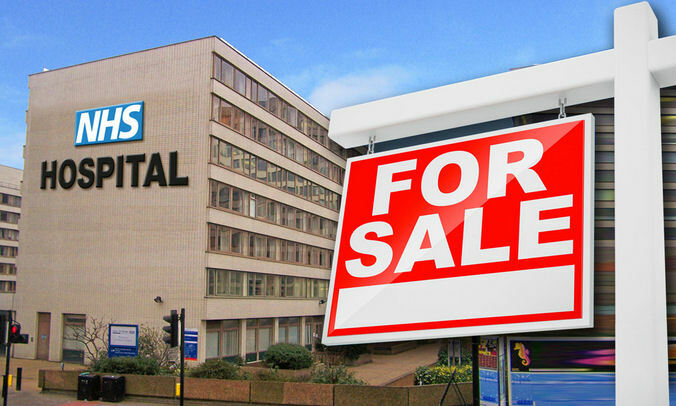 ■ FACT: the fallacy of the NHS being unaffordable has been debunked by all major health think tanks such as Nuffield trust & King's Fund along with the Office for Budget Responsibility (OBR) and other economists. A recent report from the OBR shows the NHS is easily affordable up to and beyond 2030. The OBR figures show that the UK currently spends 7.4% of its GDP on healthcare, which is set to fall to 6.9% by 2020 under the current Tory government funding settlement. 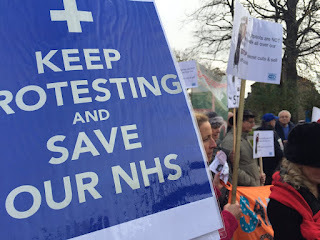 The health select committee have already shown that the £10b funding set aside to aid roll-out of Hunts NHS reforms (STPs) is less than half of what is needed to properly fund the NHS; indicating the real intention is to starve the NHS to meet privatisation requirements set up with Andrew Lansley's Health & Social Care Act 2012 (the privatisation act). The OBR figures show that this amount could easily increase to 8.8% by 2030 - evidently without an increase in general taxation. Appleby stated the 8.8% increase in spending is actually lower than the long-term growth in NHS spending. Average spend since 1954 is 4% a year, whereas an increase to 8.8% by 2030 would represent a growth of less than 0.1% a year. So the irony is, even if we're at an 8.8% spend in 2030, the UK will still be at the same spending levels France, the Netherlands, Denmark, Sweden, Germany and Japan were back in 2015 ! 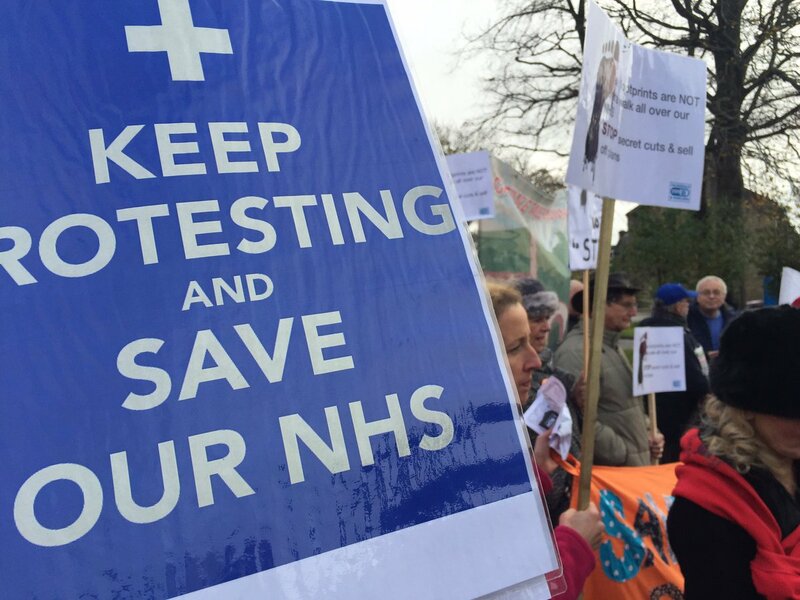 The wish to move to a radically different model of health care is purely political ideology - what many now know as denationalisation of the NHS as Jeremy Hunt espoused in his co-authored booklet titled 'Direct Democracy'. Finally, we're all aware that the Sustainability & Transformation Plans (STPs) are being rolled-out by the ex vice president of the U.S. private insurance firm UnitedHealth, and the models of care being proposed for England, such as 'Accountable Care Organisations' are based on the U.S. private insurance models. 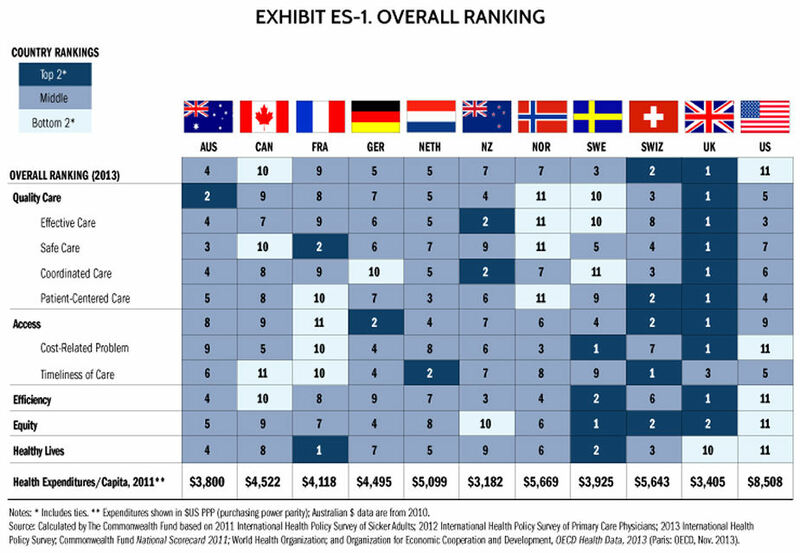 So to conclude, I've included a health spend comparison table below showing that even though the UK spends less than the other countries shown, it comes out on top for efficiency, affordability (equity), access to care and outcomes. The USA on the other hand comes an abysmal bottom with the greatest spend and the worst outcomes. Yet this Tory government want England to move to the failed U.S. model that most American citizens can't afford. And all for their Tory egotistical ideology and historical wishes of denationalising the NHS. If that doesn't put the fight back in you, then reality hasn't hit home yet of what's happening to our NHS. 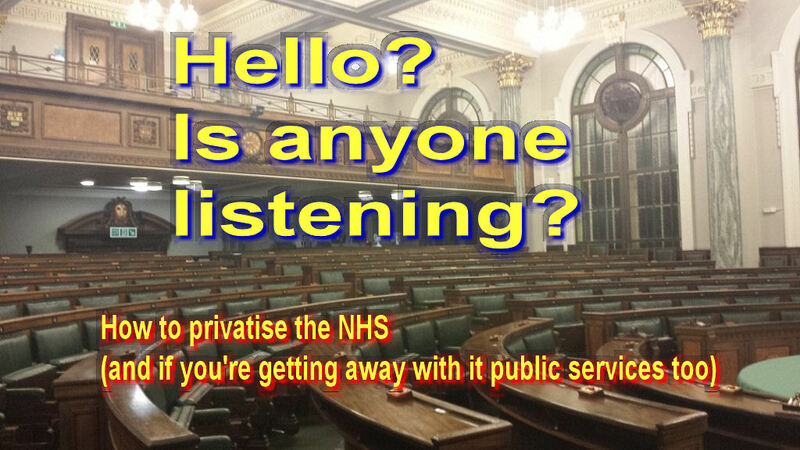 This is a wake up call, a call to arms to save the NHS before it's too late.